1. Spoon 2 Tbsp. vanilla frosting into a small ziplock bag. Frost cupcakes with remaining vanilla frosting. Roll tops of frosted cupcakes in coconut to cover. 2. Place pink sugar in a small bowl. Using scissors, cut large marshmallows in half crosswise. Press cut side of each marshmallow into pink sugar to make ears. Insert a pretzel stick into 1 short end of a marshmallow ear. Insert pretzel-stick end into cupcake to make ear stand up. Repeat with another pretzel and marshmallow ear; place second marshmallow ear next to first. 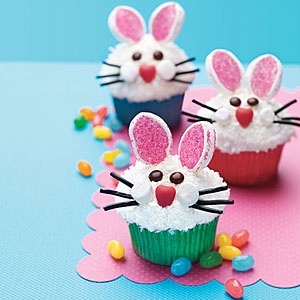 Repeat with remaining marshmallows and pretzels, placing 2 ears on each cupcake. 3. Snip a small corner from ziplock bag with vanilla frosting. Using scissors, cut mini marshmallows in half crosswise to make cheeks. Pipe small dots of frosting and attach the mini M&M eyes, heart-candy nose and cheeks. Cut licorice into 1 1/2-inch pieces and insert as whiskers. Repeat with remaining cupcakes.